More than 10 arrests have been made in connection with the kidnapping of an American tourist and her safari guide in Uganda's most popular national park, ABC News has learned. A senior commander of the Uganda Police Force told ABC News eight people were arrested Monday in Kanungu district, which encompasses the southwestern section of the sprawling Queen Elizabeth National Park where U.S. citizen Kimberly Sue Endicott and Congolese national Jean-Paul Mirenge Remezo were abducted at gunpoint while on a safari. The commander said at least two others were taken into custody Tuesday and that more arrests are expected as authorities continue searching the area and also the other side of the country's western border, into neighboring Democratic Republic of the Congo. Uganda Police Force spokesperson Fred Enanga would only confirm that "some arrests of suspects" were made in Kanungu district. "We have an intelligence-led operation, which was calculated and tactical in the early stages, and is now progressing unhindered, with raids and extensive searches," Enanga told reporters at a press conference Tuesday. Meanwhile, Ugandan tourism authorities assured the public that all of the country's national parks remain open and safe for visitors. "Through the Uganda Wildlife Authority and security agencies, new measures as well as strict guidelines to avoid similar incidents have been put in place," Uganda Tourism Board CEO Lilly Ajarova said in a statement Tuesday. "Security has been tightened in all national parks for tourists' safety. Tourists are encouraged to continue visiting the parks and to enjoy Uganda's wildlife abundance." Remezo, a senior guide for safari tour operator Wild Frontiers Uganda, was leading Endicott and a Canadian couple on an evening game drive in the park's southern Ishasha section on April 2 when they were ambushed by four gunmen in military uniforms. The gunmen apparently held the group at gunpoint before snatching the keys to their safari vehicle and fleeing with Remezo and Endicott, police said. 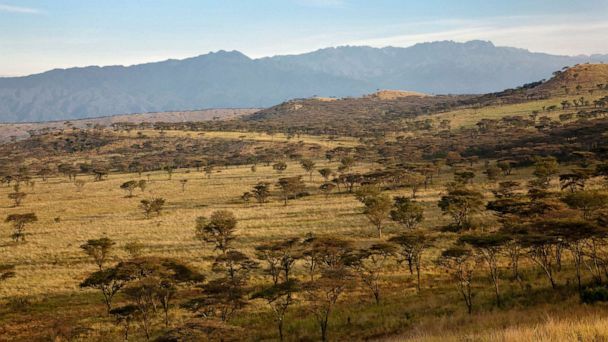 The Canadian tourists, identified by Wild Frontiers Uganda as Martin and Barbel Jurrius, were left behind and contacted the camp manager, who brought them back safely to the wilderness compound, police said. The kidnappers used one of the victim's mobile phones to demand a $500,000 ransom, which police believe was the motive behind the abduction. After a days-long search operation by Ugandan police, armed forces and wildlife authorities, Endicott and Remezo were "rescued" unharmed from the neighboring Democratic Republic of the Congo and brought back to Uganda on Sunday evening. But their captors "escaped," and the operation to track them down continues, according to Ugandan government spokesperson Ofwono Opondo. Ugandan police said they are working in close coordination with their Congolese counterparts. Endicott and Remezo were freed in a "negotiated handover, conducted between the Ugandan and U.S. authorities," according to a press statement from Wild Frontiers Uganda, which has been operating safaris in the East African nation since 1996. "We have provided as much assistance as possible to the authorities and will now continue to provide support to both Kimberly and our guide Jean-Paul as they work toward returning to their homes and families," the company said in the Monday statement. "We also are working with the investigating authorities to ascertain precisely what happened and how this can be prevented in the future." Enanga, of the Uganda Police Force, said at a Monday press conference that he did not believe a ransom was paid. However, a Wild Frontiers Uganda spokesperson told ABC News a ransom was paid. It remains unclear who paid it or how much was given. Endicott was seen Monday morning being transported by helicopter to Uganda's capital, Kampala, where police said she was handed over to the U.S. ambassador at the American embassy. It's unclear exactly when Endicott would return home to Southern California. ABC News' Nicky de Blois, Moses Bwayo, Conor Finnegan, Josh Margolin, James Meek and Sohel Uddin contributed to this report.